The Irish Web Awards never disappoint and this year was no different; Mulley and his band of organizers out done themselves again. The Mansion House was the perfect setting. Throw in a brass band to set the scene, plenty of yummy cup cakes and a late night visit from an ice-cream van and the ingredients for a most special event is complete. To win an award at the Irish Web Awards is very special, 700 entries, 105 judges and lots of great competition. 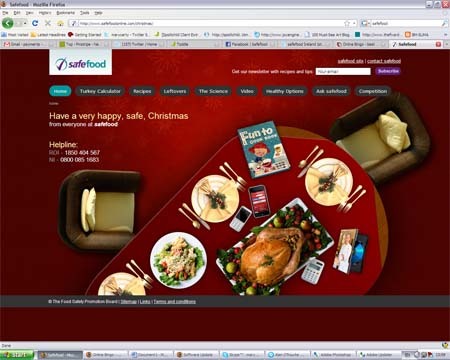 We are delighted to win Best Microsite for our safefood Christmas campaign. The project consisted an integrated Christmas campaign featuring a Microsite, Facebook and Twitter integration and an email marketing campaign to tie it all together. The site features lots of fantastic Christmas content, recipes and a cool competition. We had lots of fun developing the concept through to final launch. We even found a way to make the most of that leftover turkey with the â€œI still love turkeyâ€� campaign on Twitter and Facebook! See it here. Our second safefood project, Weigh2Live.eu was a finalist in four categories so we are absolutely chuffed. Great work comes from from great partnerships and our work with safefood over the years really demonstrates this. Big thank you to Deirdre and Fiona and all the team at safefood; Damien Mulley and his brilliant team; the judges; Realex Payments and the sponsors, Made in Hollywood for the beautiful trophy and all our colleagues and friends who help us out each day. Looking forward to IWA 2011 already.